A cat can be a good pet for a child but older family members will need to provide guidance about how to care for and treat it. Research shows children who have a pet in their home have higher self esteem and better social skills. Having a pet can help a child learn responsibility. Is your child ready for a kitten or cat? Before getting a kitten or cat be realistic about whether your child is ready for one. 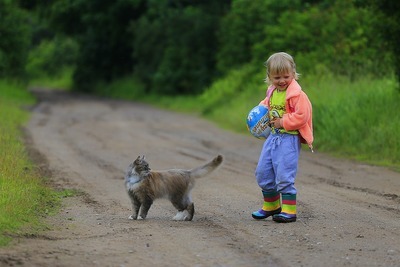 Very young children may need to be taught not to pull a cat's tail or ears. They also need to understand they must not drop or throw a cat or kitten. Youngsters who are unable to grasp the consequences of their actions may try putting a kitten in the toilet or a container of water, in which case they are not ready. Boisterous children may not be able to resist chasing and teasing a cat so it may be better to wait until they are older before adding a kitten or cat to the family. Will a cat fit in with your lifestyle? If you go on holidays who will take care of it? Are family members patient with animals and will they continue to be interested when it gets older and is no longer a cute kitten? Can you afford a cat now and in the future? Kittens need desexing, vaccinations and microchipping. Vaccinations and health checks are ongoing costs and of course food costs money. Some cats need a specialised diet and when your cat becomes a senior the costs are likely to increase. Will you supervise young children? Kittens are cute but they have sharp claws which can cause a nasty injury. Very young children may put their face next to a playful or annoyed kitten and end up with a painful scratch and even receive an eye injury. A cat of any age can inflict a scratch which becomes infected. If your cat has an inside litter tray you need to be vigilant when there is a young child around to avoid them playing (or worse) with cat faeces. Also be aware that a very young child could drown in a pet's water bowl. There are many reasons to get your child a cat but think carefully first.